A more detailed TL;DR (ha!) of the case is available at Ars Technica, where it is discussed vigorously in their Comments section. The Ars comments is more civilized than the typical internet comment section, and smarter too 🙂 For example, user HonkyLips came up with this Bose acronym: Buy Other Sound Equipment. 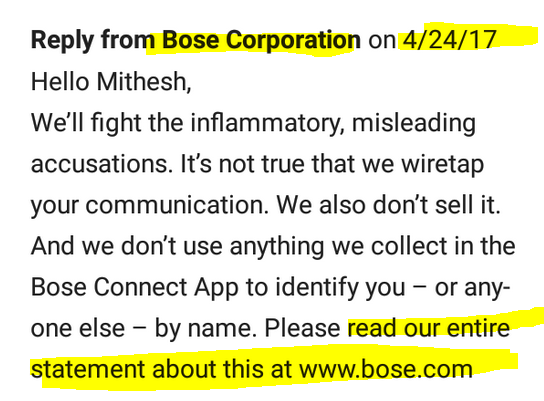 Adding of course to the drama is that Bose is currently #2 (behind Beats) in being disliked by a certain segment of the audiophile world for the combination of their prices and sound and popularity, which adds fuel to the fire. Y’all behaved this week, so Metal 571 gave us not one but two headphone reviews. And one of them is an on-ear headphone, which *SPOILER ALERT* impressed him, the planar Sine On-Ears (13 mins). The other review is now a part of headphone branding history, the Momentum 2.0 Over-Ears. That’s because in the US market Sennheiser renamed all their Momentums as the HD1 series. Something about naming rights and lawyers and things of that nature. The Sony MDR-1000X have emerged as a challenger to the Bose QC35 perceived dominance on the ANC front, so the Audiophiliac at C|NET decided to square them off. Fostex the people! A 3-way “shootout” of three Fostex wood-y headphones is now out at Part Time Audiophile, featuring the TH-610 and two variations of the MassDrop TH-X00. The Verge goes electrostatic as their resident audio reviewer takes a look at the Shure KSE 1500 earphone system. From the next generation of reviewers, DMS3 TV shares his take on the Audio Technica M40X (which developed their own undercurrent counter-hypetrain to the craze that was the M50 and M50X) in this 9 minute video. The adult coloring trend is expanding in many directions, custom-coloring headphones is a thing too, and DMS3TV has a 6 min video on the topic. Do you want to have a versatile switch for your headphone system? Do you want more than what off-the-shelf products offer? Are you comfortable with some electronics DIY work? Reddit user TravAndAlex has a DIY post ~ don’t miss the seven picture imgur post with commentary below each picture. One more thing, if you are a T-Mobile customer, on Tuesday April 25 in 2017 you can score a free 12-week digital subscription to Billboard as part of T-Mobile Tuesdays. Another option is now available to anyone looking for a full-service music subscription service, the Pandora service is out of beta and anyone can sign up. If you sign up through app stores, you will pay an “app store tax”, so you are better off singing up on their website.